This portrait of ‘Lady Hampton’ is one of two that were made by Richard Cosway of the sitter, the second – an unfinished likeness – having appeared at auction in 1984. Elements of style and of costume date this likeness to the mid-1780s. This period in Cosway’s work saw the artist make brilliant use of the natural translucency of the ivory support in consort with thin washes of watercolour, stippled in the face but often with bravura flourishes in details of costume. Cosway at this time also showed great skill in his subtle over-emphasis of certain details of the sitters’ physiognomies, most notably in the eyes in relation to the head and the head in relation to the body. It was this ability so adroitly to flatter the sitter that awarded Cosway his first royal commission. It came in 1780 from George, Prince of Wales – later George IV – and was the first of many likenesses of the future king that propelled Cosway to the status of perhaps the most fashionable artist working in London. This position was further shored up in 1785 when Prince George, who was almost as much in love with Cosway’s likenesses as he was with himself, awarded the painter the title of Primarius Pictur serenissimi Walliae principis, cementing Cosway’s status as his primary iconographer. 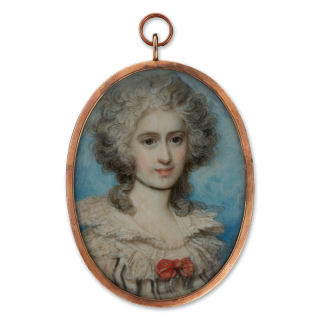 From this point, Cosway became the miniaturist most in demand in London. At the height of his career, twelve sitters a day could be expected to walk through the doors of Schomberg House – where his neighbours were Thomas Gainsborough and his wife, Margaret. From here, Cosway and his wife, Maria, whom he had married in 1780, held a glittering salon, frequented by the great and the good of Georgian high society. Here, Maria – a talented musician and artist – would enchant visitors with songs at the harpsichord in rooms that were hung with Cosway’s extensive and impressive collection of Old Masters that included works by both Rembrandt and his idol Rubens. Cosway was regarded as among the most discerning collectors of his day, an influence that he brought to bear on the impressionable young Prince of Wales, whose vast collection he helped to shape. The apogee of Cosway’s career as a collector perhaps came not in London but in Paris. Visiting in 1786 – whilst Cosway’s wife conducted a clandestine affair with Thomas Jefferson – Cosway arranged for the presentation of a set of tapestries then thought to be by Raphael to the king, the ill-fated Louis XVI. Overawed by the gift, Louis awarded the artist with a spectacular set of tapestries made in the workshops in Les Gobelins, a gift of the calibre usually reserved for princes and potentates. Indeed, ever the diplomat, Cosway in turn presented the tapestries as a gift to his prince and patron, George. However, tragedy stalked the Cosways’ happy house on Pall Mall. In 1790, Maria gave birth to the couple’s only child, a daughter – Louisa – named after a Corsican patriot. Almost immediately, she left for Italy likely suffering from severe post-natal depression. When she returned in 1794, Richard, who had raised their daughter, had moved from Schomberg House in favour of a house in Mayfair and had sold many of his Old Master oil paintings (though he kept many of the drawings). Then, in 1796, disaster befell the couple when Louisa died of a sudden illness. Devastated, the pair expressed their grief in highly contrasting ways. Maria soon returned to Europe, where she dedicated herself to the cause of women’s education. Richard found comfort in a deep spirituality and mysticism that reflected itself in his art. The death of the child seems to have driven the couple apart, for it was only fourteen years following her departure in 1801 that Maria returned to Britain. By this point, however, Richard had fallen ill and Maria, who still cared deeply for her husband, made it her duty to care for him in his final years. Following a further brief sojourn in Europe, she returned to London in 1817, where she nursed her husband as his health deteriorated until his death in 1821. When the sad moment came, Maria organised the artist’s lavish funeral, spending large sums to ensure that it was of the requisite pomp and splendour. She also took great care over the sale of his prized art collection and artistic effects; having sold some of his prized works at auction, she took offers for her husband’s own drawings from both society portraitist Sir Thomas Lawrence and George, by now King George IV. However, considering the offers too low or perhaps not quite being able to bring herself to part with them, Maria took the drawings with her to Italy, where she continued her work as an educationalist.